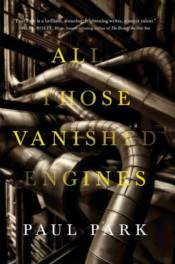 In "All Those Vanished Engines, "Paul Park returns to science fiction after a decade spent on the impressive four-volume "A Princess of Roumania" fantasy, with an extraordinary, intense, compressed SF novel in three parts, each set in its own alternate-history universe. The sections are all rooted in Virginia and the Battle of the Crater, and are also grounded in the real history of the Park family, from differing points of view. They are all gorgeously imaginative and carefully constructed, and reverberate richly with one another.